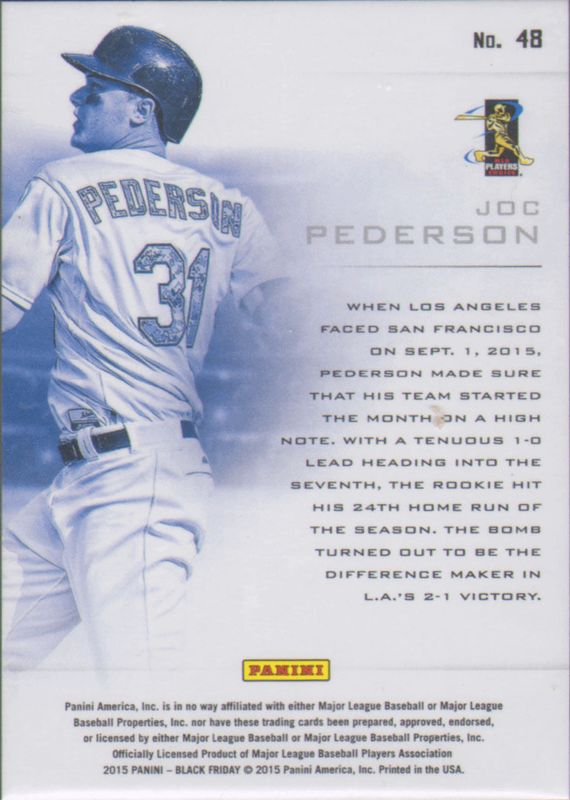 As I was preparing this post featuring the Dodger Panini Black Friday cards given away at local cards shops to eager collectors this past weekend it came to my attention that I never wrote about the promos that were given away last year. So, this post will include the Panini Black Friday Dodger cards from this year and the last. First, let's start with 2015. I have yet to see a complete checklist that includes all the relic and patch cards that are available. If a Dodger player is included I'll update this post. In the meantime, check out the base card and Panini Collection card that is available below. 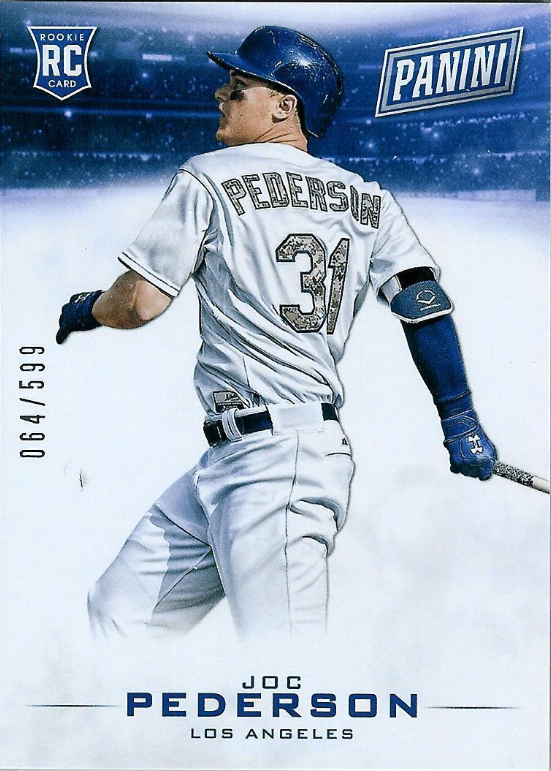 The autographed Pederson card is a parallel to its base card and is numbered to only ten copies. Talk 'bout breakin' up the play. 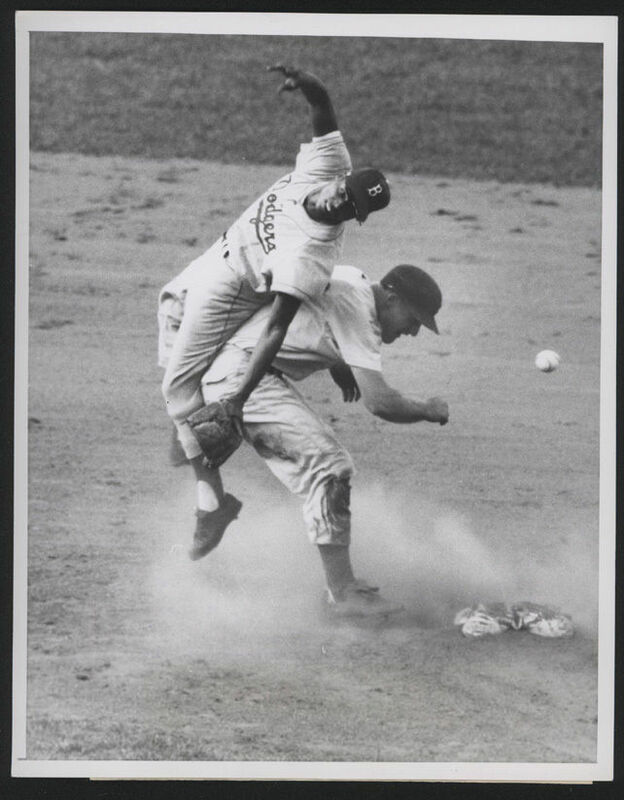 Check out this fantastic vintage "United Press" press photo, dated August 28, 1956, of Cubs outfielder Pete Whisenant with an aggressive slide against Dodger second baseman Charlie Neal. To use hockey parlance, it looks like Whisenant hip-checked Neal off the base. Fortunately, the missed opportunity to get the extra out didn't lead to a run, but the Dodgers did lose the game, 4-3. Photo above via an eBay auction. I'm a huge AJ Ellis fan, so this is welcomed news. Via Mark Saxon at ESPN, "Catcher A.J. Ellis will return to Dodgers in 2016." They retained one of the most popular players in the clubhouse, agreeing to a $4.5 million, one-year contract with catcher A.J. Ellis on Wednesday. "The LA Dodgers have sent over this gorgeous hunk. AJ Ellis who, ya know, let me play with his balls... or practice, at least." Via Bernie Wilson at Yahoo Sports, "Padres manager Andy Green names McGwire bench coach." Wow! According to Erika Owen at Travel + Leisure, Dodger Stadium is the 5th most Instagrammed place in the world. This is a head-scratcher. Via Jon Weisman at Dodger Insider, "Dodgers part ways with Juan Nicasio." Nicasio led all Dodger relievers in 2015 in innings pitched, finishing the year with a 3.86 ERA, 1.56 WHIP and 10.0 strikeouts per nine innings. He had a 2.92 ERA through August 30, before allowing nine runs in his final nine innings and ending up off the Dodgers’ playoff roster. Via Eric Stephen at True Blue LA, "Dodgers reportedly hire Neil Rampe, Nate Lucero as new athletic trainers."